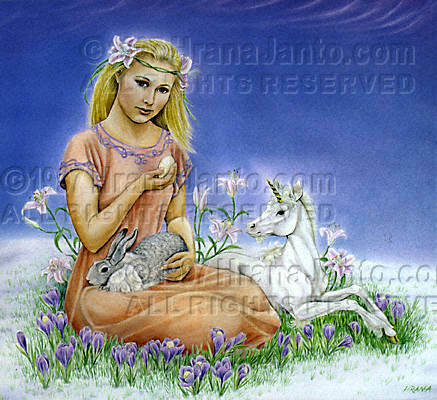 I painted Eostre in 1992 for Llewellyn's 1993 Goddess Calendar. She is included in the Goddess Oracle. The Germanic name for spring's goddess means "movement towards the rising sun." Ostara was celebrated in the fourth month of the year, April, according to the British scribe Bede the Venerable, writing in the seventh century CE. Over a thousand years later, the Grimm brothers found that she was still honored in Germanic lands, where her name was used for the month she ruled. In Anglo-Saxon, her name became Estre or Eastre, which survives today in the festival of rebirth, Easter, and in the mood encouraged by springtime, estrus. She was honored among the Germanic people with painted eggs, a tradition that survives today.